As a mom of a toddler, it is important that you think about the kind of toys that you would want your child to have. Toddlers get bored quickly, so their toys must be fun to play with. Toddlers are learning and developing, so it's good if their toys are also educational. Toddlers are discovering their place in the world, so their toys must reflect real life. Toddlers are continually growing, mentally and physically, so toys that are versatile will allow them to play even if they have surpassed the toddler years. One amazing brand of toddler toys is that of Melissa & Doug. Their toys are simply impressive and worth every penny you spend for it. This brand provides a wide variety of gender-neutral, educational, fun and flexible toddler toys. If you have a toddler, you may want to check out this list of most loved Melissa & Doug toddler toys for girls. Wooden toys are a favorite of parents and kids. It's rustic and simply adorable. The wood is durable, eco-friendly, and safe even if your little one accidentally chews a small bit off it. 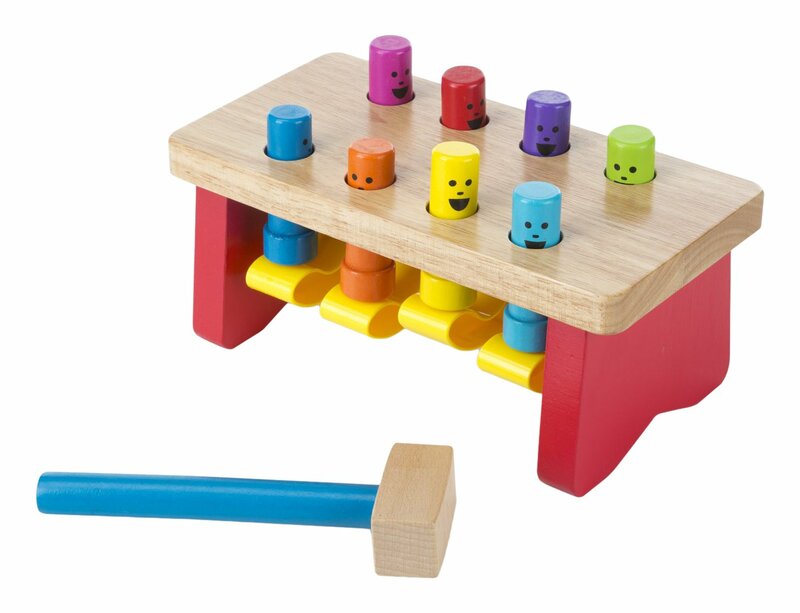 This Melissa & Doug pounding bench with mallet lets kids hammer down the pegs. They're on a lever so they pop up again! This brain teaser can offer hours of fun. This Melissa & Doug Shape Sorting Cube is a classic wooden toy that is adorable, durable, and safe for your toddler and the environment. This is based off the classic block and shape sorting cubes, only it's made out of wood, not plastic. 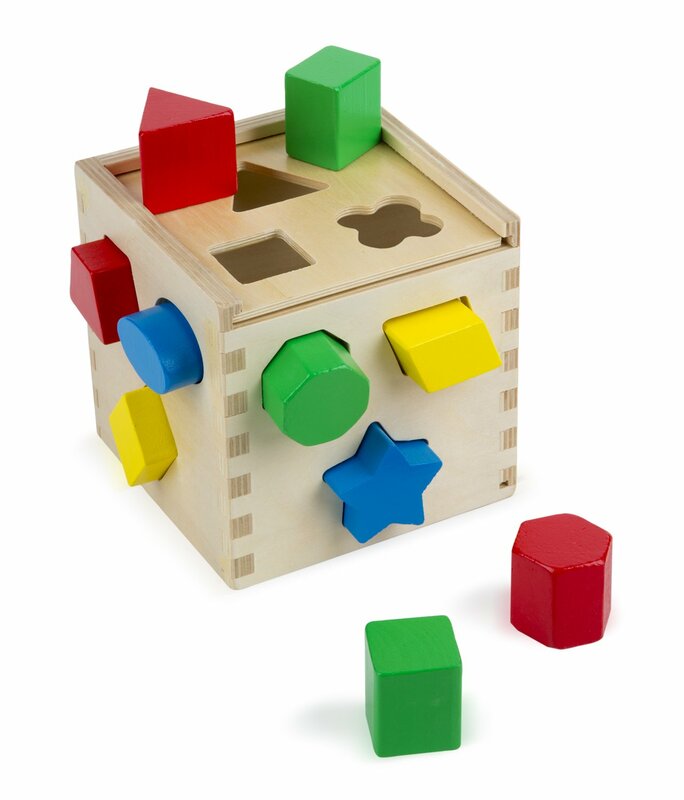 It features 12 shapes in different colors, which should provide your toddler a lot of brain stimulation. There's a reason why you can find bead mazes like this Melissa & Doug bead maze in a doctors' waiting rooms and in schools around the world: Toddlers love them! This one features various puzzling paths for the beads. It is small and portable. And it has suction cups so it won't fall off the table. Your child can learn about colors and shapes and develop eye-hand coordination as well. Soft toys are versatile as they are not just fun for babies, but they are good toys through the toddler years. 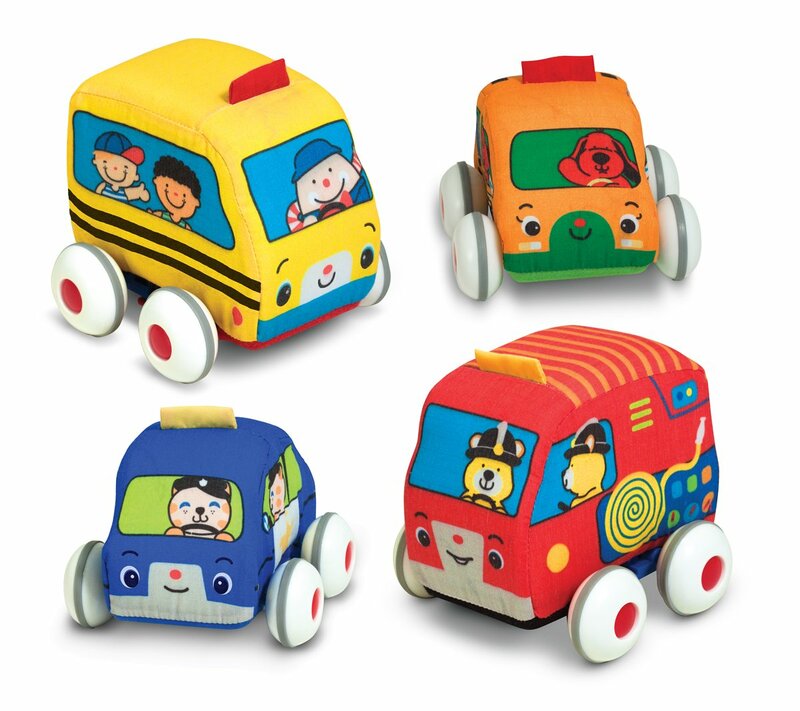 This Melissa & Doug K's Kid's Pull-Back Vehicle set features four soft vehicles: a taxi, a police car, a school bus, and a fire truck. When your child pull the string and let go, these soft toys will zoom across the floor smoothly because they have solid wheel bases. The wheels are removable making them safer for younger babies and easy to clean. 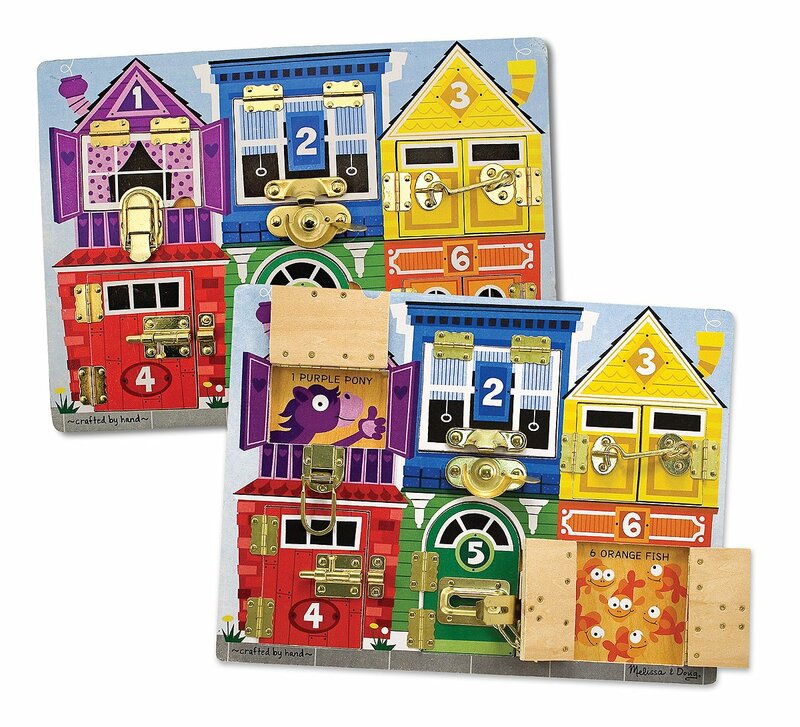 Wooden jigsaw puzzle are good educational toys for toddlers. It helps develop hand-eye coordination, fine motor skills and problem solving capabilities. 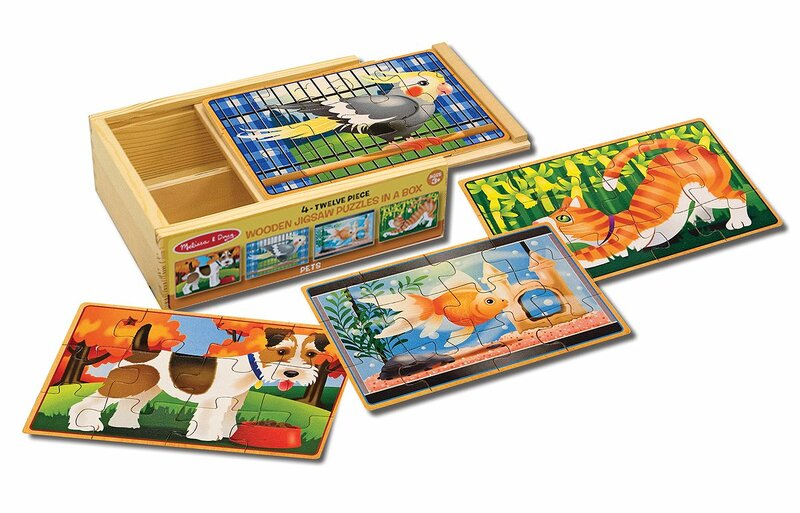 This Melissa & Doug pets 4-in-1 wooden jigsaw puzzle set includes 12-piece puzzles of a fish, a cat, a dog and a bird. It comes with a wooden storage box that doubles as a puzzle tray. This toy is recommended for your 36 months to 5 years old child. Another classic toddler toy that girls really enjoy playing with is fake food. 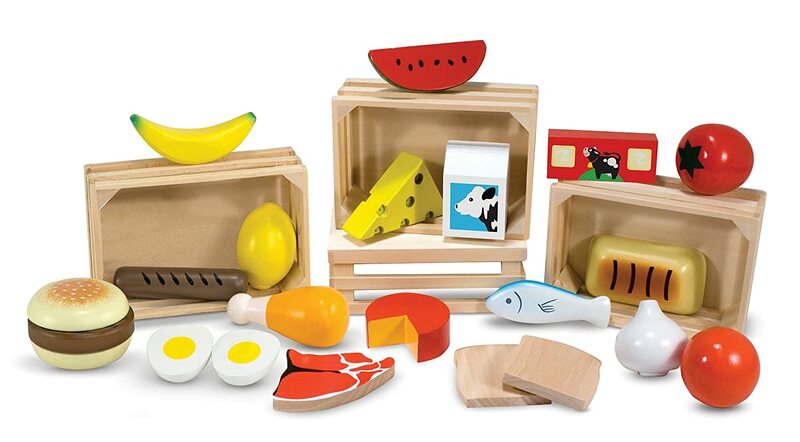 This Melissa & Doug Food Groups comes with hand-painted wooden models of food and 4 wooden crates. The set includes food from the five food groups so that your girl can have a healthy pretend play. Let your child enjoy using her imagination while playing with these food models: bread, milk, cheese, fruits and vegetables, fish, eggs and more. This toy is recommended for kids 3 years and up. You probably still don't know yet if your daughter wants to be chef. But this set of Melissa & Doug stainless steel pots and pans sure is a nice addition to a little chef's pretend toys. These are small enough for your toddler girl to use, but they are strong and durable. They look so real that it will make them feel like they're really cooking. 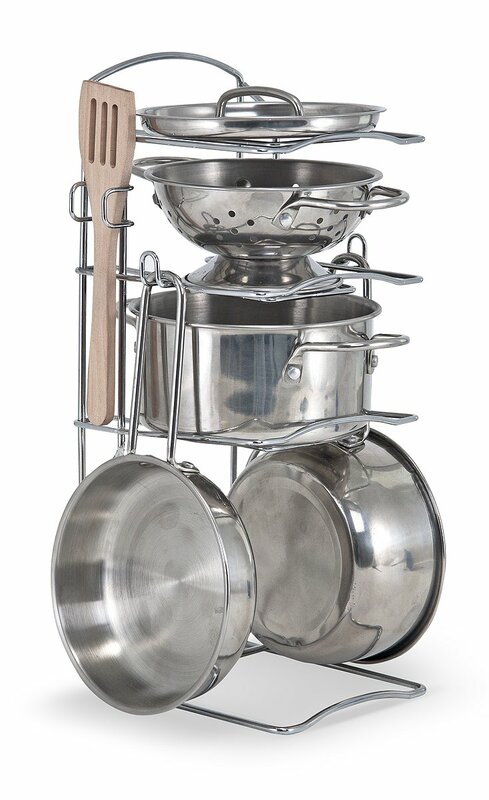 The set includes a colander, 2 pans, pot with lid, a wooden spatula and spoon, and a rack. This pretend play kitchen set is perfect for girls 3 years and up. These fun activity/coloring board books are perfect for your toddler who needs to practice holding a pen to color or write. This Melissa & Doug Water Wow! activity set includes 3 spiral-bound, reusable board books and a refillable water pen so your little girl can use it again and again. 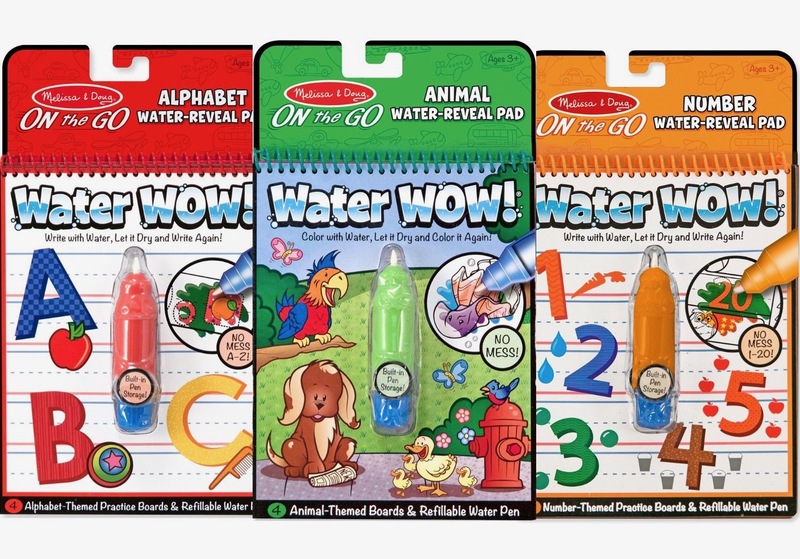 The chunky-size water pen is easy to grip and fill with water. The three included board books feature the alphabet, numbers and animals theme, which are perfect for your 3 or 4-year old girl who's getting ready for Kindergarten as well. 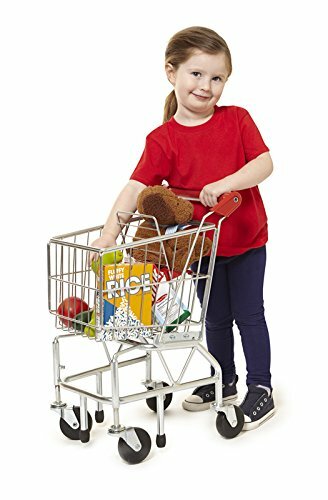 This Melissa & Doug toy shopping cart is a perfect companion for the Melissa & Doug Food Groups toy set. Your little girl can play pretend shopping with her friends. They could arrange the fake foods on a table or shelf and pretend they are shopping in the grocery store. This toy shopping cart has a realistic kid-size suitable to 3 - 6 year olds, so your child can comfortably play with it. It is easy to maneuver with its pivoting front wheels and its very sturdy so she can play with it safely. Toddlers love to play with their hands. 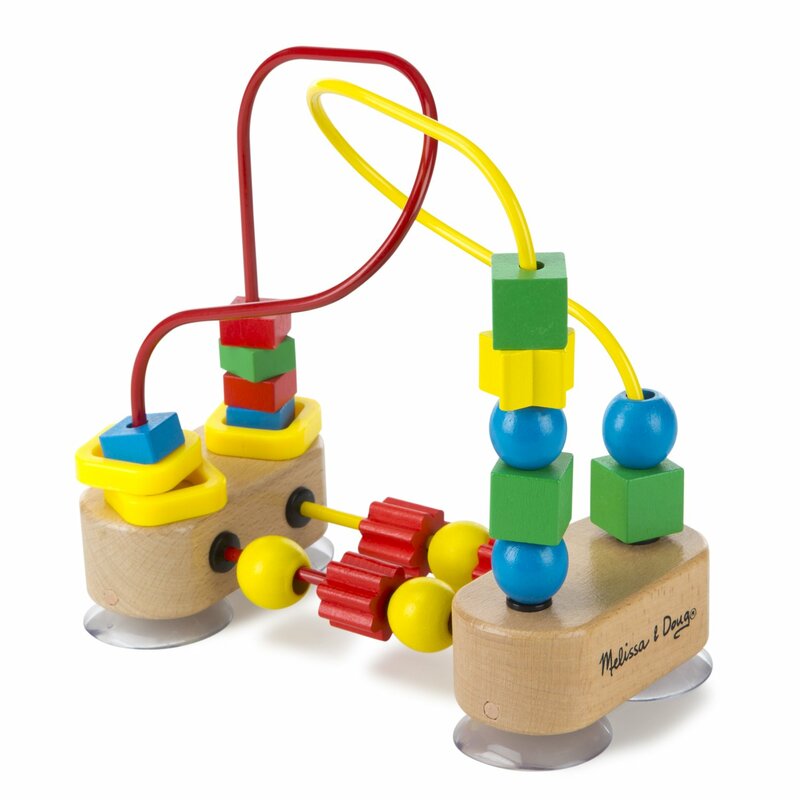 With this Melissa & Doug latches wooden activity board, your little 3-year-old girl (even younger) can get busy with her hands and build dexterity. She'll have fun figuring out which one of the 6 different latches slides, hooks, snaps or clicks and enjoy hearing the clicking sounds, too. This vibrant colored activity board can also teach your kid to count, identify colors, shapes and objects. 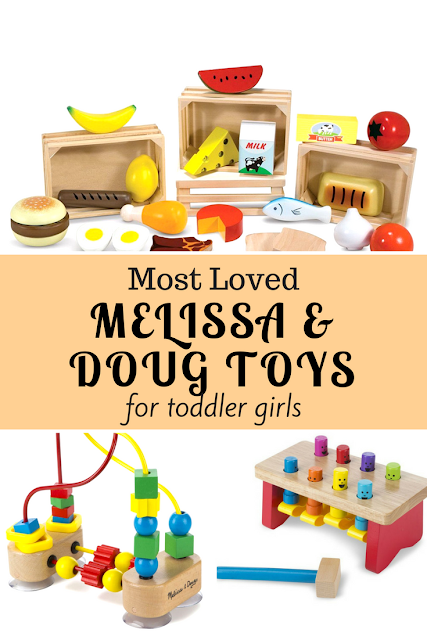 Melissa & Doug has a big collection of good quality toddler toys for girls (and boys as well). Check this page on Amazon for their toddler toys not mentioned in this list.